Well, it was yesterday, anyway. The problem I have doing anything is my tendency to obsess over every tiny detail. Last week I decided the photos I have of the fabric in my store really stink; the color is completely off, and obviously it looks different on every single device we have in this house (and with a husband who works in technology, that number is pretty substantial). So I spent all week obsessing over this, and yesterday I finally decided to go out in search of a Pantone color chart, so that I could include the Pantone number in every fabric description for folks who don’t have time to order swatches and wait for them to arrive. Little did I know that said color charts are actually around $400. Uh, no thanks. So then I decided to just use Pantone’s $7.99 app instead, which includes a color picker, allowing the user to point the device’s camera at something and the app gives you the corresponding Pantone color names/codes. Perfect. But in researching this, I discovered that without calibrating the color on the computer screen, the app is useless. I then spent three hours researching this whole calibration thing, just to finally conclude that I simply can’t do it; not because I’m particularly dense, but because, short of “rooting” the tablet (don’t ask), it just can’t be done. I spent the next few hours trying unsuccessfully to figure out work-arounds, short-cuts, or cheats. Nothing. I did, however, learn all about computer stuff I will probably forget by tomorrow. Thus my torment. Finally I came to the realization that fabric manufacturers use dye lots. Each dye lot has slight variations; a bolt of fabric that matches Pantone 188 today might end up a Pantone 186 when I re-order it. So if the entire world of fabric is ok with slight color variations, why in the world was I obsessing over a minor color variance on my tablet? 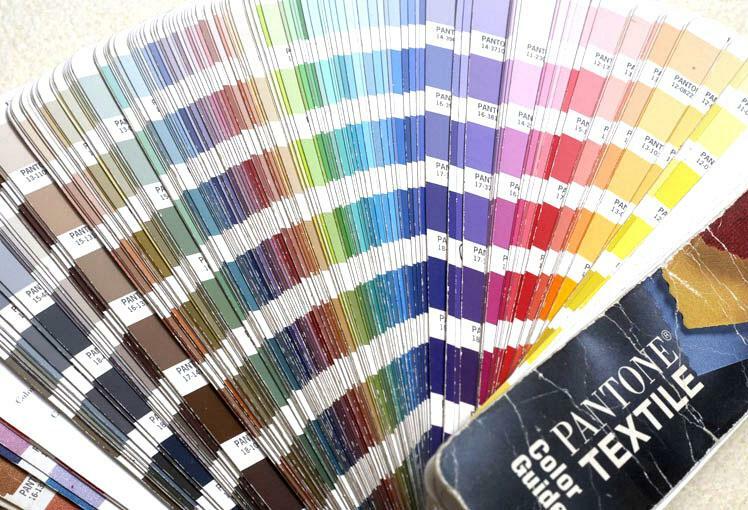 If I tell a client that a piece of fabric is a Pantone 280, will they really reject it based on the fact that it is actually a Pantone 281? Obviously not. Finally, I achieved “joy,” the third and final portion of Monet’s famous quote. $400 worth of color chips. No thanks. I decided to use an excellent and free download from a 21-page Pantone color chart. I also found this one, which also gives RGB and CMYK translations, but since it’s web-based, I figured I may not always be able to access it. I looked up the Pantone color that most closely matches each piece of fabric in my shop (and with, oh, 100-ish shades of blue, this was quite an investment of time, energy, and discernment), and included the number in my self-generated SKU’s. This way, I can call a vendor and ask for fabric not by color name (I found hundreds of ridiculous color names online while in the course of my obsessive research, including “Cal Poly Pomona Green” — too obscure, despite the fact that my husband is an alumnus and kid #1 is currently a sophomore there — and “Sunset” — useless, since last night our sunset included about sixty colors, pinks, blues, purples, and oranges), but by Pantone color. Plus it makes me sound super intelligent. Obviously I’d rather reorder fabric by dye lot. But this isn’t always possible, and if I focus on it too much, I may fall back into the obsession phase of Monet’s quote. For now, I’ll include the warning to all clients that they may not always be able to come back later for an exact color match, and focus more on the second part of Monet’s quote — just how many different shades of blue mesh I actually have in my shop at the moment. It’s truly a joyous thing to behold.